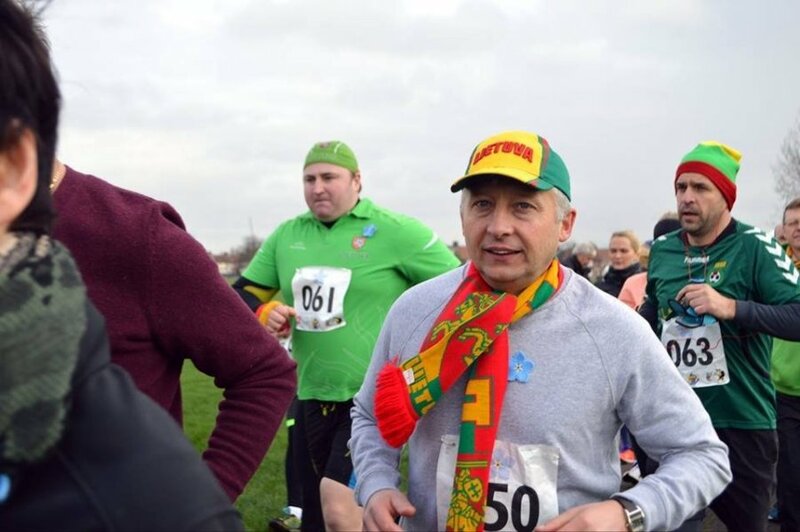 Despite the inclement weather, Lithuanians living in London met at Parsloes park, Dagenham on the morning of Saturday 9th January for a commerorative run to mark the historic events of January 13. The pouring rain did not have any effect on the people or on the joyful atmosphere. At 11am the runners set off on a commerorative run to mark 25 years since the events of January 13. One of the runners, Vydmantas Martinaitis said he was nicely surprised as the event showed him that Lithuanians can unite not only when watching basketball or football games over a beer, but also by participating in a tribute to a very important day in the country’s history. London resident Vydmantas declared that January the 13th is a very important date for him and that the events of 1991 are connected directly where Lithuania and its diaspora are now. He added that the events of January the 13th gave Lithuanians the freedom that today is allowing to gain a wider understanding of the world and a more enjoyable life. “They came smiling, they left smiling" said Kestutis Dabravolskas, one of the event’s organisers, after the run had finished. He felt the memorial run was a huge success, and hopes the event will become a yearly event. Kestutis said that the date of the marathon next year will be published shortly. Organisers hope that this tradition of commemorating the January 13 Defenders of Freedom Day will attract more and more people every year in London. This first event attracted 65 participants but the marathon of the next year is expecting to attract three times as many runners. Jolita who took women’s gold in the run, and bronze overall, said she felt surprised at the number of Lithuanians in London that showed such enthusiasm for their home country. She said there was a great and fun atmosphere at the run. “Everyone was in a good mood. Smiling, even though it was raining terribly.” She said with a laugh. She also hopes that next year she will win the overall gold. “Next year I will definitely run again and will call even more people to join, she said. So even with was a small number of people, it gave the feeling that Lithuanians, whether they be in London or Vilnius will not let the memory of what happened on that day ever be forgotten.